We have collected inputs from many of our clients to build a tool to help you quantify your results and justify investments in Enterprise Architecture (EA). Simulate the Return of Investment (ROI) of enterprise architecture at your company! If you are working as an Enterprise Architect, there have probably been several times in your career where you had to justify the invest in the tools you use, projects you do or even the mere existence of your team. While the value of Enterprise Architecture is intuitively clear to many people, thehard numbers, in terms of dollars or euros, are hard to grasp. What is more transparency on the IT Landscape worth per se? Top management and stakeholders will understand your efforts better if presented in a business case format. That is why we created a business case template for Enterprise Architecture. The template serves as a starting point to calculate the business case for Enterprise Architecture at your company. You can adapt all the inputs to your individual situation. What is the invest in Enterprise Architecture? What is your application cost base? What are the assumptions regarding your results? 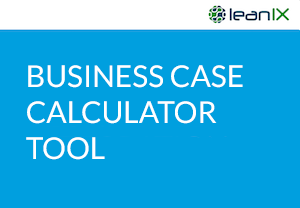 The tool allows for over 30 inputs to calculate a business case. Approach us if you have any questions. We are happy to help! Fill the form on to the free enterprise architecture(EA) business case calculator.